Accor – Newsroom | The Mercure Paris Boulogne houses a vertical urban farm spanning more than 350m2 on its rooftop. The harvest from this first trial season has helped provide the hotel with supplies, and has made it possible to distribute baskets of fruit and vegetables to locals in the neighborhood. 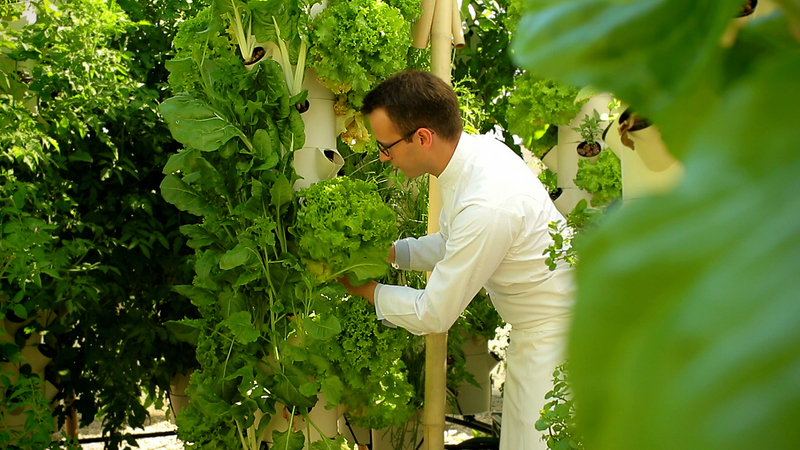 The Mercure Paris Boulogne houses a vertical urban farm spanning more than 350m2 on its rooftop. The harvest from this first trial season has helped provide the hotel with supplies, and has made it possible to distribute baskets of fruit and vegetables to locals in the neighborhood. Grown on the top story of the hotel, vegetables, red berries, salad leaves and herbs are picked every morning for lunch and dinner, thus ensuring the maximum freshness of the produce sourced from a completely local food network. Seasonal produce as well as rare varieties of strawberries and heirloom tomatoes are given priority. On average, a quarter of what is produced is used by the restaurant with the rest being sold in baskets. Caroline Ebran, Head of Sustainable Development Projects at AccorInvest, explains, “Through this project, AccorHotels is confirming its commitment to positive hospitality and to making progress in relation to its target of having 1,000 vegetable gardens by 2020. For AccorInvest, which is behind this project, the aim is to play a key role in shaping the city of tomorrow by enhancing the environmental value of our buildings and developing the local supply chain for both our guests and the locals living close to our hotels”. The urban farm was installed and is being operated by Agripolis, a start-up specializing in aeroponic urban farming. Without resorting to chemical fertilizers or pesticides, this soilless growing method means that plants can be watered and given nutrients within a closed circuit and as a result use 10 times less water than in conventional farming. The system developed by Agripolis includes 216 PVC columns that are suspended from a bamboo structure, and can be set up on standard rooftops with limited load-bearing strength (90 Kg/m2). This project is part of AccorHotels’ Planet 21 sustainable development program, whose two priorities by 2020 are firstly to offer healthy and sustainable produce while simultaneously eliminating food waste, and secondly to commit to the energy transition of its buildings. In a drive to combine these commitments, in 2017 AccorInvest trialed various approaches at its hotels in Ile-de-France region to support urban farming, such as at the ibis Styles Paris Bercy, where teams created large vegetable garden terraces spanning 1,000m2, which served as the backdrop for the summer evenings hosted at the pop up bar Le Papa Cabane, or at the reception of the Novotel Suites Rueil-Malmaison, which organized educational activities focusing on its vegetable garden every Wednesday for pupils from the local elementary school.